Spring Has Sprung! Enjoy the flowers and the Creek! Enjoy the quiet elegance of this creekside home nestled among trees, woods, and stream in the hamlet of Christopher Creek. This special retreat is in the mountains 20 miles east of Payson, directly below the stunning Mogollon Rim vista. Less than a mile from the highway, the home is easy to access in all seasons, yet still perfect for those who enjoy quiet, wildlife, and beauty all around them. The hiking and fishing are outstanding in this forested area abounding with lakes, streams, and magnificent mountain views. Or you can enjoy the amenities of nearby Payson, with its antiques, museums, restaurants and shopping. The home’s large back deck is directly next to the stream, making it a delightful area for eating, relaxing, and wildlife viewing, with many squirrels and birds lending their chatter to the burbling creek sounds. The rim has many hiking trails, and is a great area for cross country skiing. Or simply stay warm at this refreshing retreat and restore your spirit among the trees and sparkling water. Inside the home awaits another kind of beauty: understated refinement rare to find in a mountain hideaway. The 1900 SF home has two master bedroom suites with private dressing areas and bathrooms, each with patio doors adjoining the 80 foot deck. There is a third central bathroom with shower for guests, next to the laundry and pantry. Cozy, private enough for two, yet able to sleep five, the home is large enough to entertain even more if desired. Having owned this home for the past fifteen years, I can attest to what a joy it is to have quiet couple time or joyous family gatherings here. The home is roomy and comfortable. Come see! The back deck is simply the best in Northern Arizona!!!!!! 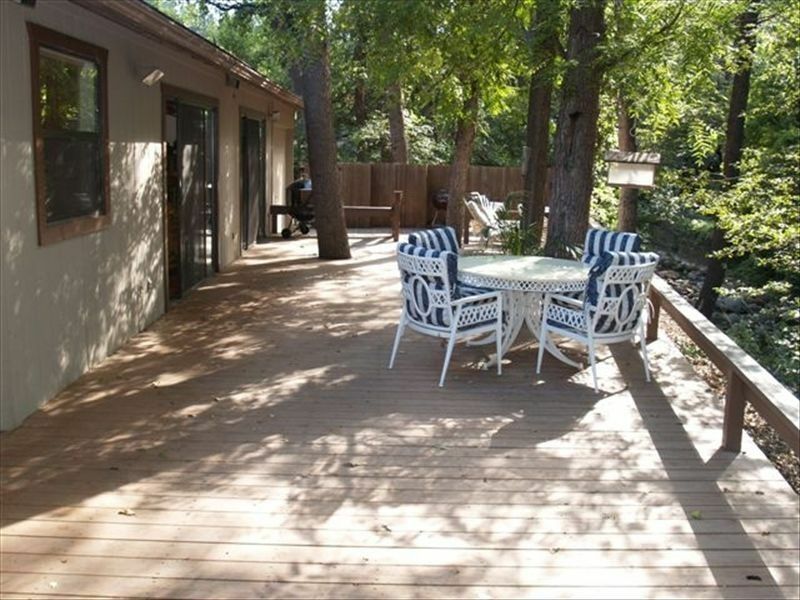 Enjoy the large deck next to the creek! A few CD's - not much! This is such a beautiful place. Our kids had a blast. Anita is a wonderful host. We can’t wait to come back. Beautiful location, huge deck directly looking over Christopher Creek. We just returned from a 4 day family vacation at this great location. The home is large, with open kitchen, dining and great room. Kitchen had everything we needed including spices. Anita was very responsive when we had questions. Huge deck directly overlooking Christopher Creek. The creek was flowing and the views were beautiful. We will definitely return. Great place right on the creek! The house is well stocked with everything you may need. We enjoyed sitting on the deck listening to the creek and watching the wildlife. It was fun to see your kids enjoying this beautiful place and the games and toys. Hope to see you again s9on! This is a great place to stay! The furnishings are comfortable and the kitchen is well stocked. The surroundings are beautiful. Anita was helpful and a pleasure to work with. A true gem, we hope to return. 4 guys stayed here for a weekend getaway of DnD, Nintendo, board games, and barbeque, and this did not disappoint. Very well maintained, lots of space for games, equipment for cooking, comfortable beds, and a responsive and communicative host. We were so happy with the trip. This house has a great layout, its spacey and comfy and amazing views of the back deck from both bedrooms and the dining. What made this view even better was the snow! It started snowing as we arrived and it didn't stop until later that night, then it snowed more the next day. It was such a pleasant surprise, we enjoyed it as much as we could before we left. The whole neighborhood was peaceful, as well as the creek. Loved the back deck to it. Beautiful view, and the snow was a big plus! Anita is super friendly and is quick to respond if you have any issues during your stay. Oh, and her brownies are delicious as well! We would definitely love to come back again! Thanks Nikki! We look forward to your return! *** Angler’s dream – Fish nearby Canyon Creek, best loved stream of Zane Grey, or other well stocked lakes within 30 min. distance.